Jump if you love English! What motivates children to strive for academic excellence? Just as you & I are different, what motivates our students will be different things. Some students are motivated by inspired oratory. Some require bribes of sorts. Some require a push or a slap. Some require social intervention. Some require a combination of the above. The thing is… if we don’t try, we’ll never know & our students may never feel the need to strive for academic excellence. My students come from a poor socio-economic background. A majority of them live in longhouses. Most of their parents are subsistence farmers, subsistence fishermen, or blue-collar workers doing menial work for meagre sums of money. Furthermore, their level of English is atrocious. A majority have difficulty forming accurate sentences; even those in the first classes. Their environment & background do not help them progress further in life. They are poor so they do not study. They do not study so they become poor. A viscous cycle. This is why good results are important. With good results, doors to scholarships & sponsorships will be opened. That's why it is so important for the students here to study hard. It is their only way of progressing beyond what they know & see here in the jungle. Every teacher who works in such a situation needs take a serious look in the mirror & ask themselves: What can I do to help my students achieve the better grades? How far am I willing to go? Many years ago, I took a deeper look at the PMR English paper. I found out that it really does not take much to get an A in PMR English. Like a good hustler, I pushed my techniques & drills onto my students. It worked wonders as my classes began to break school records for As in English. In 2010, there were 4 As in my class. In 2012, there were 8 As in my class. I was very harsh & hard on my students. I saw the potential in them & I wanted them to go for it whether they liked it or not. I justified it thinking medicine might taste bad but it is good for you. Actually, children think very differently. They are more concerned about the here & now than what’s going to happen in the future. Doing what I do here, most urban kids would have called their lawyers or their grandmothers would have thrown their false teeth at me. My lovely students, however, were too afraid of me to say or do anything disobedient. One reason why I love them so much. When I realised that the rewards had to be equal to the effort put in, other than what I did on the regular, I decided to promise them a weekend trip to Sibu. When they delivered, so did I. I kept my promise in 2011 & 2013. Even when I didn't teach the best class in Form 3, I rewarded the students for their efforts as in 2012 & this year. Why reward them? I don't know if you can understand this. For children in a rural school surrounded by trees in the middle of nowhere, getting an A in English is a massively BIG thing. Sitting on top of the express boat to Sibu because the boat was full. Nobody seemed to mind. Why a trip? Wouldn't a RM100 gift voucher do? A voucher is a reward. Nothing special about that. A trip is in a whole new dimension. I want to do more than reward. As should any sneaky teacher, it is a lesson of sorts. Stuff that cannot be taught in the classroom yet even more useful. A trip opens up the mind. It helps people see things from a different perspective. I want my students to be able to see things differently from their ancestors because everyone is limited to achieving only what they can see. The more that they are exposed to the world, the bigger the possibilities in their lives. For some of them, it was their first time at a cinema! Why Sibu? Sibu is the nearest city. Yet, it a place where 50% of my students have never been to because the cost of going there would be too great for their parents. To my students, Sibu is probably like what Singapore would be to people from KL. No matter how bad fast food is to our bodies, children love them. A LOT. Our final meal, we had butter prawns, meat, veges, & more meat. Yes, this one was for me. Malaysians love makan. 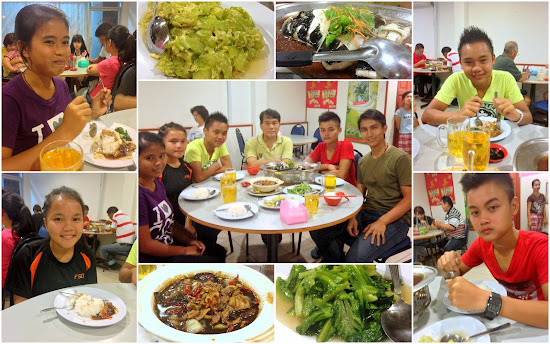 I exposed my students to all types of food during the weekend: Chinese, Indian, Western, pastry, cakes, etc. During our meals, we'd talk about different cultures IN ENGLISH. They struggled a little bit but were very willing participants. I'd exercise their HOTS muscles too by asking them questions like "what have you learned" or "how can you do it better". Met up with Chelfi Chua, a former top student of SMK Song (a neighbouring school). I asked her to share her views &, particularly, her study tips & how she applied for scholarships. Met up with Cikgu Hailmi, a famous award-winning GC who is serving wholeheartedly in rural Sibu. I asked him to share his views & also tips for Science stream subjects. He also expressed an interest to come to my school for a talk. Something which all other GCs I have asked before rejected outright. I look forward to working with him both at my school & at his school. Met up with Clement Chieng, the principal of the top school in Sibu, SMK Saint Elizabeth. I asked him to share his views & also how his students achieved as they did under him. During our meals, I'd invite a few of the best people I knew to join us & share their thoughts/expertise with us. I invited a past excellent student, a top teacher, & a top principal. My hope is that by rubbing shoulders with these successful individuals, my students would greatly benefit from the proximity & also hearing their thoughts/perspectives. God knows my students need role models & they need to hear from various sources that grit & perseverance are the fundamental keys to success. Now comes the question many of you want to know. How much did this 3D2N trip to Sibu for 5 people cost me? A mere RM1100. Would you spend RM1000 to inspire 4 lives to dream bigger & aim higher? I would. Any day. The best part is it doesn't stop at 4 people. They'll return to school & tell stories = Friends will be inspired. They'll return home & tell stories = Families will be inspired. They'll grow up & teach the same things to their children = Generations will be inspired. This is the virtuous cycle I am hoping to create. Giving a gift that keeps on giving.